Sports Car Digest covered more than 60 vintage car races in 2010, starting with the Phillip Island Classic in Australia and ending with the 1000 Millas Sport in Argentina. Our photographers lugged around multiple cameras and lens, taking tens of thousands of pictures along the way, all in an effort to impress readers with the perfect shot. Similar to our Best Vintage Car Racing Photo of 2009 contest, we need your help to choose the best vintage car racing photo from 2010. We narrowed down the thousands of photographs to the following 40 images, chosen solely upon the number of times they were viewed by readers throughout the year. Please vote by leaving a comment with your favorite image. Write-in candidates: if we didn’t include your favorite picture, share a link of what you think was best. We’ll announce the winner in the January 27th edition of our newsletter. Win Massive Prizes: We are spicing things up this year, as we will randomly choose THREE winners among the comments that will receive a large print of their favorite photo, plus an extremely rare Sports Car Digest hat. Be sure to include your email address in the comment form so we can reach you. Extraordinarily difficult decision…so many are so very right on the money. Great job to all. Love the Dennis Gray shot of the Cobra 289 at Sears Point, Vanhalle’s Porsche images are spot-on too, but the best for me is the Michael DiPleco pic of Jon Shirley’s 1934 Alfa Romeo P3 of Jon Shirley during U.S. Vintage Grand Prix Watkins Glen. Iconic car driving at iconic track = best photo of the year. Panning, Speed, Accuracy, Lotus and Road Atlanta make it a winner. 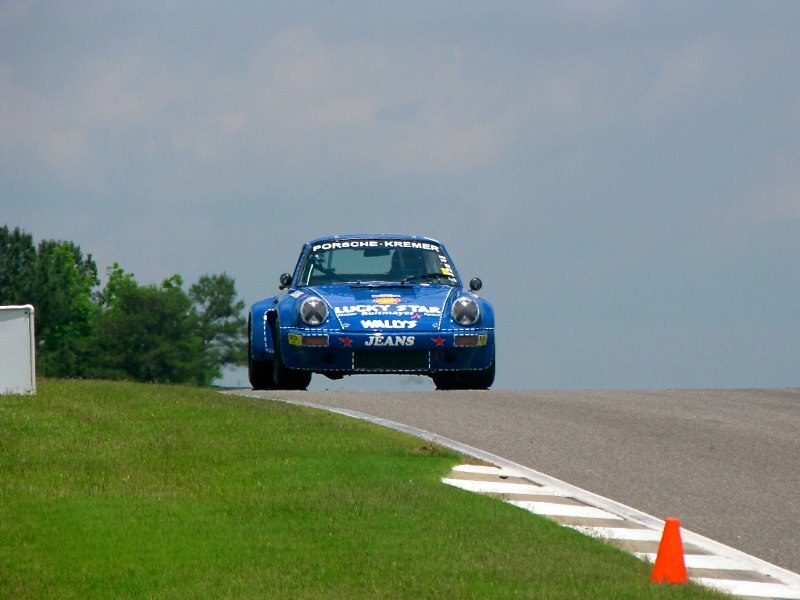 I am going with Darren’s shot of the Elan. Darren Pierson’s Shot of the Elan! LOVE it – amazing photo! Excellent composition in an historic turn at an historic track. I’m a little biased here–the Maserati in the fog at Laguna Seca says it all for me. Fabulous cars racing through the fog of time. Isn’t that what Vintage racing is all about? I agree with Dan Mensinger. Dennis Gray’s photo of cars racing through the fog at Laguna Seca is amazing. It not only see but feel those cars, the race and the place. The sweep of the fog somehow makes it timeless. Coloring, vibrant background, plus great impression of speed makes my choice the 1970 McLaren M8C at Kohler International Challenge, Tim Kemmis. Beautiful and at speed. Nice job Tim Kemmis. Well, really beautiful picture from Tim Kemmis. Check out the 1965 Lotus picture. The care is hi res with the background a blur. Incredible panning with only the turning wheels blurred. I love this photo. For me the best picture is the Porsche 934/5 at the Nurburgring . Nice car with the rear wheals locking up . And a lot of action in the picture . This one: McLaren M8F at SVRA Road Atlanta Season Finale (photo credit: David Ferguson). The colors are perfect. It sure helps that The Corkscrew at Lauguna Seca is my favorite spot in road-racing to spectate! I like the 917’s at the bottom of the corkscrew. I was lucky of being at the lower portion the turn that day, and this picture brings back great memories of Bruce Canepa chasing down Brian Redman at 110% the hole race, what a show..! Well, hell once I exclude my images the choice comes down to two images. David Ferguson’s McLaren M8F at Atlanta. Great use of the late afternoon yellow orange sun just off the horizon to force shadows and to intensify that McLaren orange and blue to say nothing of the green and red leaves on top of that Georgia red clay. The other image is Tim Scott’s E-Type at Algarve. Up close, lots of motion, flying left front wheel and this image is sharp. The Jag says speed. All said it’s Ferguson’s McLaren M8F. I really like the up close and personal shot. It really shows the mesh of car and driver as one. The Bugattis in the corkscrew is my favorite (Dennis Gray). I love the close match up of cars, the way the guys are leaning and looking into the corner, even the license plates on the cars. For me, this is what vintage racing is all about. The choice is complicated by: favorite machine; favorite track; artistic framing, and/or being there then, but my choice is Dennis Gray’s Maserati in the fog at the Laguna Seca corkscrew, that ought to be on the cover of their next race program book or poster. What a surreal shot. I thought it was an oil at first glance. Photographer is a true artist! Tim Kemmis shot at Road America of McClaren M8c. Dennis Gray’s pic of the Maserati at the Laguna Seca Corkscrew in the fog says it all for me. Love the angle it was shoit from and the compostition. Number two would also be a DG photo of the classic Mini up on two wheels in Portland! Great shots, all. My favorite was Mr. Ferguson’s McLaren M8F. I love the way the color compliment the car. A complete shot with great composition. Marshall Autry’s shot of the 1971 Tyrrell gets my vote. He captures motion like he’s freezing time. It’s gorgeous! 1971 Tyrell 004 (Marshall Autry). There’s something about this close up that just draws you in and makes you wish you were there — and I mean RIGHT there, driving, not just watching! The Bugs at Monterrey all the way! The composition, the depth of field, the movement! A lot of great pictures but the picture of the 1976 Porsche 934/5 at the Nürburgring Oldtimer GP taken by Jurrie Vanhalle gets my vote for the best picture! Great!!! David Ferguson’s photo of the M8F at Road Atlanta was fantastic. There were lots of great photos, but that one really brings back memories. I like mine the best, with that said. Bugattis in the Corkscrew by Dennis Gray. Something about the angle of view, All the shots presented are wonderful images. Just something with me and pre war cars. A hard choice, but I vote for the 1975 Chevron B29 by Marshall Autry. 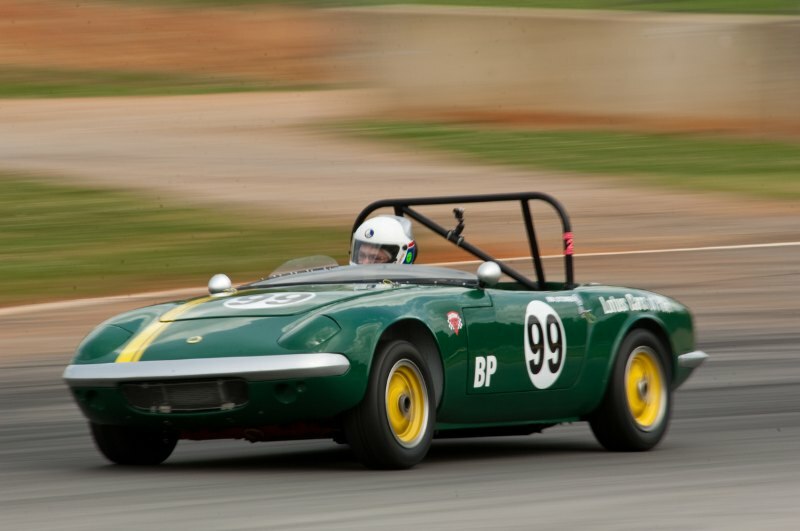 LOVE the ’65 Lotus Elan photo! Well done Pierson! Thats a serious amount of commitment by Michael in such a valuable car! Great show! 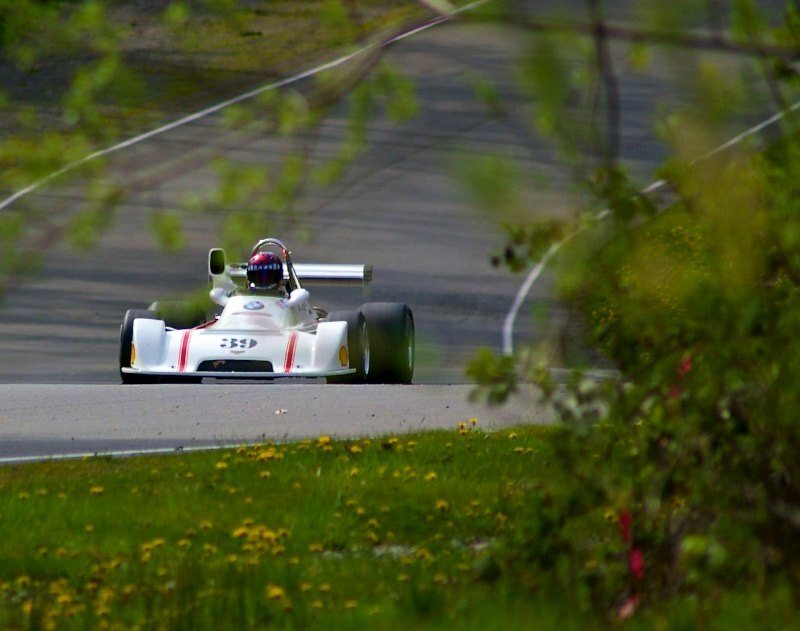 Really like the shot Marshall snapped of the 1971 Tyrrell 004 of John Dimmer during Pacific Northwest Historic Races. Love the implication of the personal pursuit of racing, the love of just being in these cars. This has not been easy. So many great pictures! Excluding my picture, I’ve decided that Dennis Gray’s Bugattis in the corkscrew stands out the most. It’s well composed, and most unique. I love the three blue cars and three white helmets leaning the same way. Dennis Greys’ shot of Rob Walton in the Maserati. It reminds me of the “Glen” in the morning. The Elan is a strong candidate, but its roll cage is so prominent I can’t vote for it. Julian Majzub in his gorgeous Alfa 308C shortly before visiting the straw bales at Goodwood FoS is also pretty wonderful. But for me it has to be the 206 Dino at Le Mans – the prettiest of sports cars at one of the best events (even though it was way too warm for comfort that weekend). You’ve got to love Martin Brundle (or is it Mark Hales?) getting Nick Mason’s GTO sideways with tyre smoke out of the Goodwood chicane. Let’s all hope owners like this don’t ever sell to a museum. Great shot Tim Scott! My vote goes to the 1961 Austin Mini Cooper at the Portland Historics. The Mini is one of the most modest of racing cars and been represented throught the world for dozens of years. The photo itself just portrays speed and effort, wheels off the ground and obviously trying quite hard!! 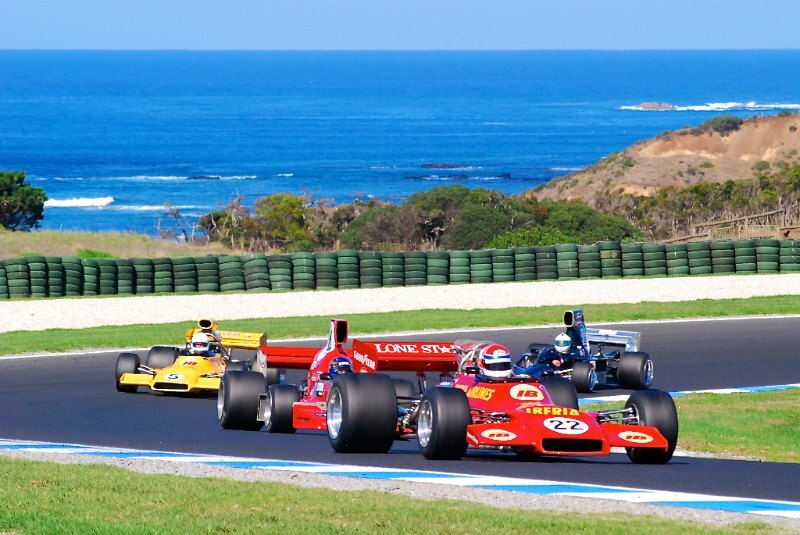 Second for me is pic 1 of the historic F1’s at philip Island – fantastic composition!! Has to be the M8F in glorious McLaren papaya against the wonderful fall foliage at SVRA at Road Atlanta by David Ferguson – whilst many of the other shots are technically brilliant and capture everything about the sport, this one has high artistic merit – I would hang it on my living room wall as opposed to my den – and, perhaps more importantly, the car is almost totally divorced from it’s modern setting, so appears as if in period whereas many others are situated in an obviously contemporary scene. Next year I’ll submit my own photos from Mont Tremblant but kudos to SCD for another amazing year – thanks so much guys and to all your fabulous contributors! While there are so many great images to choose from, my favorite is Tim Scott’s photo of a Jaguar C-Type during the Algarve Historic Festival. I love the way this picture encompasses three magnificent cars negotiating the corner with the lead car moving to the right while the other two cars appear to be “diving” to the left. The view of the handsome Jaguar is superb with terrific lighting and crispness and then as a bonus, this image spectacularly includes the unique, attractive shapes of the Maserati and Lotus. Wow! THe shot of Peter Giddings in his Alfa flashig by the T series MG at the Lime Rock Vintage Festival is brilliant! 1. Stirling in the Osca, the composition is fantastic, the car is perfect and it’s STIRLING MOSS! 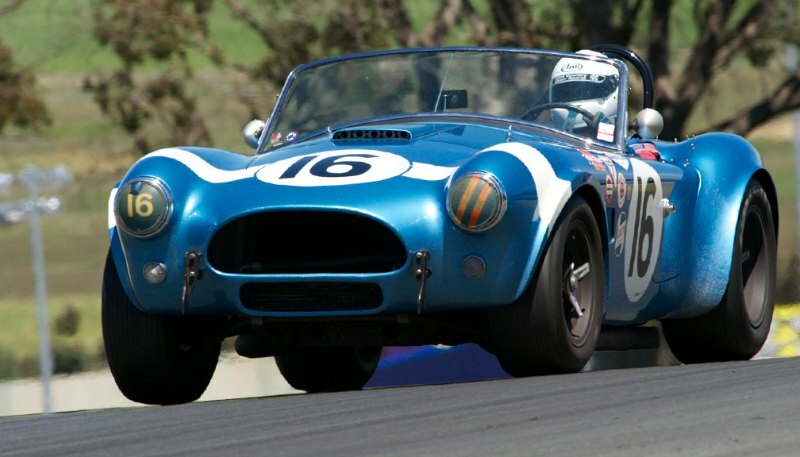 1964 Cobra 289 of Lynn Park. First, apologies for the errant capital “H” and my misspelled “flashing” earlier, poor keyboard skills. I neglected to add the Bugattis in the Corkscrew as my second choice, fantastic composition! No wonder I love this website. Amazing photos….amazing cars. This year I vote for Michael DiPleco’s photo of the 1931 Alfa at Lime Rock. All are great, but my vote goes to the Maserati Tipo 60 in the foggy corkscrew at Laguna. The best photograph in 2010 is no doubt the Ferrari Testa Rossa at Crested Butte. Every car in the 40 photos is a classic, but this photo is the classic, unlike all the others. Runner-up is the funky, cool Jagermeister Porche with all the decals and script on it. Thanks for the great eye candy for all us car fans! All are fabulous….and each portrays a different aspect of excellence, for example, the Tyrrell gets you more “up-close” to the action. I vote for either of the 2 Goodwood photos, the Auto Union “D” or GT40. What a group of fantastic photos! The photo by Tim Scott of Stirling Moss hauling an OSCA through a bend at the Silverstone Classic could have been taken years ago. Moss continues to wear his old style hat. Wonderful picture! Gets my vote. I have to vote for Bob Leitzinger’s Lotus Elan, since I owned two Elans and think they were the best cars I ever owned for sheer driving fun. Besides, the picture is well done. The 1958 Ferrari 250 Testa Rossa by Jeff Best is an incredable piece of mechanical eye candy, and the guys in it seem to be having fun, no helmits, no fire suit. Second choice would have to be the 1965 Cobra Daytona Coupe. My vote goes to Bugattis in the Corkscrew at Monterey Motorsport Reunion by Dennis Gray. Great cars in a great in a great place in an a great artistic composition. So many of the pictures look great, but this one just caught my eye. This is too hard! 🙂 If push comes to shove, I think that the Alfa of Jon Shirley at Watkins Glen would be my pick. It just evokes the feeling of being there. 1. Lynn Park in the reconstituted remains of CSX2259 at Sears Point, driving, as is his wont, as if it was Sebring 1964 all over again with the spirit of Bob Johnson urging him on ! 2. “Bugs Away at Monterey” – fab compo by…Dennis Gray ! All of the photos are so great. Thanks to all who took them. My favorite is the Tim Scott pic of the Team Salzburg 917K at the Goodwood Speed Festival. The 917 is my all time favorite race car and this picture taken from a low angle shows off its great lines. I like the live race action of the 3 cars approaching the turn. Yes, and yes again. I have been urging for years a bow tie or club/regimental tie, dress shirt or if they must a polo shirt, string back gloves with split WW11 fighter goggles. For later cars the P. Hill/ S. Moss baby blue driving coveralls. For Americans from the South West Can’t Bustom striped coveralls with a blue work shirt. Hey Dennis. I like to see someone who appreciates the past. Jack. 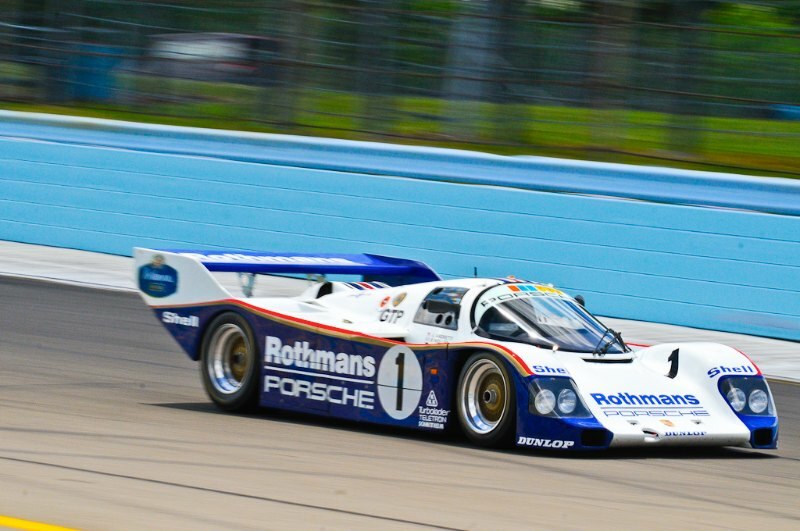 I vote for the 962 at Watkins Glen. One of the most beautiful racecars ever, and wins since there are no Chaparral pictures. I might be a bit biased but the F5000s at Phillip Island is my favourite as I used to watch the F5ooos at Warwick Farm and Oran Park in the 60s and 70s and attend the historic meetings at Easern Creek when they are on.Havng been to Phillip Island to watch various forms of racing both natonal and internatonal(cars and bikes) the F5000s with the Bass Straight behind them flicks my switch.Thank you for brilliant newsletter. On content alone leave out the Elan, Porsche 911 and variants, E Type, Mini and Cobra(UGH). I love the dueling Lolas, the photo of the McLaren in the trees is breathtaking, the F5000’s win hands down on content and the pictures of the Porsche 962 and especially the 917 are great. For all that my vote has to go to the Brabham BT42 in the rain. Very atmospheric pic and have always loved the BT42 with its unusual triangular body shape which show out well in the photo. due to it’s motion and angle of the car. thanks again for a great e-zine! Love all of them I remember watching most of the cars run in person at diferent tracks… So hard to choes I say all!!!! It’s one of my all time favorite cars and the picture really captures the excitement of a racing moment where the driver is hanging on wondering if his moves in the preceding seconds were really the right ones! How can you not love Dennis Gray’s photo of the Birdcage Maserati in the fog at Laguna Seca at the Monterey Motorsports Reunion!! BROOOOOOOOOMMMMMMMMMMMM !!!!!!!!!!!!!!!! I vote for Bugattis in the Corkscrew at Monterey Motorsport Reunion (photo credit: Dennis Gray) because it revives the spirit of the twentyes I can hear the sound of these engines passing away to another lap it´s sensational ! The Team Salzburg 917K cresting the hill at Goodwood just hits all the right notes for me. Trees in the background, hay bales on the side and a 917K at speed….it doesn’t get any better than that!! The Phillip Island F5000 photo for sure. I will go with the white E type. with a wheel in the air………LOVE IT !!!!!!. Racing is action. Cars turn, accelerate, brake, lean, slide and smoke. Good racing photography captures the spirit of the speed, noise and risk of competition. Panning at 160th or 125th of a second is nice, but I want to see more. Vanhalle’s Jag E type has nice light, good graphics and a car is obviously in motion, close to the edge. Gray’s Cobra has a nice low angle of the car accelerating out of a turn. Scott’s Ferrari GTO shows the car with the tail out coming out of the chicane and look close. This multi million dollar Ferrari has some paint scuffs around the front edge of the right front wheel opening. Details that show this car has been driven in competition. VanHalle’s 1972 Porsche 911 RSR seems to have just punted that white sedan. Look at the angle of the front tires and the position of the cars. Note the debris scattering. Too bad it isn’t the shot of the impact. My vote is Gray’s 1961 Mini Cooper up on two wheels. It is obvious the car is being driven hard. 1934 Alfa at the Glen. Beautiful color and shadows w/ the red car against the greena nd blue background. Cars on the track are a beautiful thing, but pictures of vintage cars “in the wild” like the 1958 Ferrari 250 Testa Rossa of Rob Walton as it passes Mount Crested Butte are ASTOUNDING! My vote is for Stirling Moss in his OSCA FS372, photo by Tim Scott. Ferrari 250 GTO during RAC TT Celebration Race at Goodwood Revival. Tim Scott’s shot of the Salzburg 917K at Goodwood is simply terrific! Only the car and the road are sharp – everything else just blurred. The shot enhances the powerful stance of a great sportscar. And it does not pretend to be a shot from the past – the Goodwood sign in the background reminds us all that this is a memorable car on a memorable occasion. 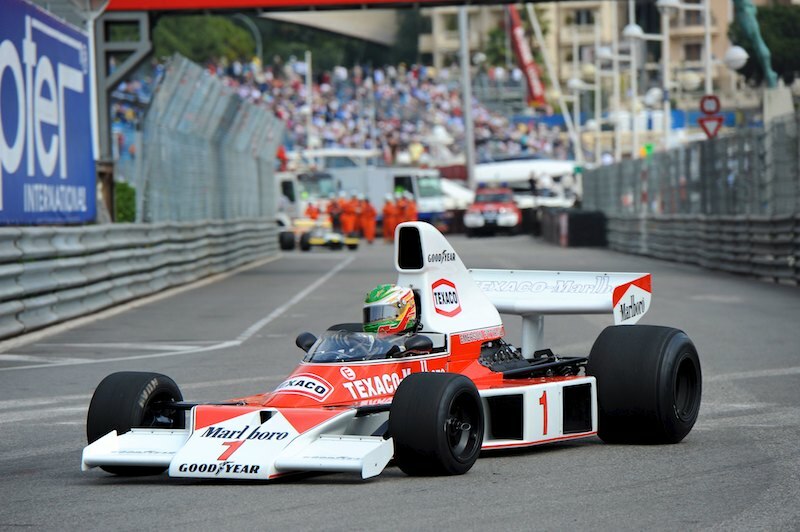 Lots of nice pictures, my favorite is the McLaren M8F That is one nice, fast looking machine! There are several great choices here, but the Bugattis in the Corkscrew get my vote. Three nearly identical cars, the helmets,the body english… It’s like choreography! The best vintage car racing photo must have be outstanding in each of these four categories: Best VINTAGE, Best CAR, Best RACING, Best PHOTO. The photo must be dynamic — one look at it and there’s no doubt that the car (or cars) aren’t just parked and posed — they’re MOVING, FAST, RACING. The car(s) must be beautiful, make-you-swoon pleasing to see. The photo must be well-composed, well-lighted, and photographically superior, utilizing strong technique such as good “bokeh” (sharp main subject jumping out from a soft-focus background). All of these are great, but if I have to pick one, I’d go with the shot of the McLaren M8F @ Road Atlanta! Strictly speaking”Vintage” is pre 1931, but allowing a bit of licence Nick Mason in the 1939 Auto Union gets my vote. The sheer brutal look of the car is awe inspiring. I choose Stirling Moss in his O.S.C.A. I have a soft spot for the marque, after having the pit next to the Rodriguez brothers O.S.C.A. at the Sebring 12 hours with our Elva entry. Their car ran the race effortlessly, and when I looked under the hood after the race, I was impressed – the engine was immaculate, showroom fresh. Lots of great photos though I wish you had slightly larger images to fit my widescreen computer. 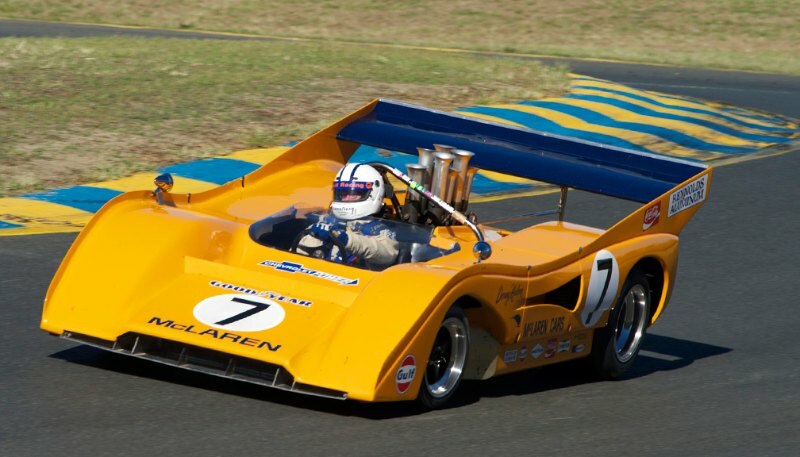 In any case my favorite is the Mclaren M8F. Perfect blend of car and background, great colors etc. It has spent a lot of time as my computer wallpaper. I have allways liked GT40s and the “bokeh” is great on many. My vote is for the three Bugs in the corkscrew. It reminds me of a classic shot by David Friedman of 3 Speedsters duking it out at Riverside at the apex of a corner – a photo which all Porschephiles have etched in their collective memories. My compliments to the photographer – great shot! The 1975 Chevron B29 at SOVREN Kickoff is a great shot. All wonderful, but I have to choose the glorious McLaren M8F at Road Atlanta shot as my choice – the colors seem to ‘fly’ off the car! Very hard not to pick the F5000’s at Phillp Island, but I have to go with the McLaren M8F at Road Atlanta. Brings back memories of watching the Can Am at Riverside. Minus the trees of coarse. All beautiful photos. Have to vote for the 1975 Chevon B29, Soveran Kickoff. Colors and composition are excellent. I vote for the Soveran Kickoff, photg Marshall Autry. Make that the Tyrell 004. Wish I was behind the wheel. Love this picture! Wish I was behind the wheel. The Tyrrell 004 by Marshall Autry really caught my eye. Great composition. Can imagine that it really is Jackie Stewart. 3 Bugs in the Corkscrew, agreeing 100% with Ronald above. The The Jag/Birdcage/Lotus at Algarve captures the spirit also, but the composition of the Bug pic is wonderful. Paul’s criteria also auger for the Giddings Alfa…. You did say “Vote early, vote often” right? BTW, what’s in the background for the Alfa shot? Has to be the Ferrari 166MM, did it spin, or did he catch it? Could be the Lotus Elan, did they really roll that much? Sterling Moss in his OSCA FS372 gets my vote. Great driver and a car with an incredible body. What’s not to like? I chose these because each shows a beautiful car, still with an attitude in a corner. Hard to split between the Lime Rock pictures of the Tipo B /P3 Alfa of Peter Giddings and the Type 35B Bugatti pic below it. Good side-on shots are always hard to get. Special mention to the Nurburgring Oldtimer shots too..
Tough choices, no wonder you want multiple judges so to speak. My first choice would be McLaren M8F at SVRA Road Atlanta Season Finale it looks like a staged Autumn shot. 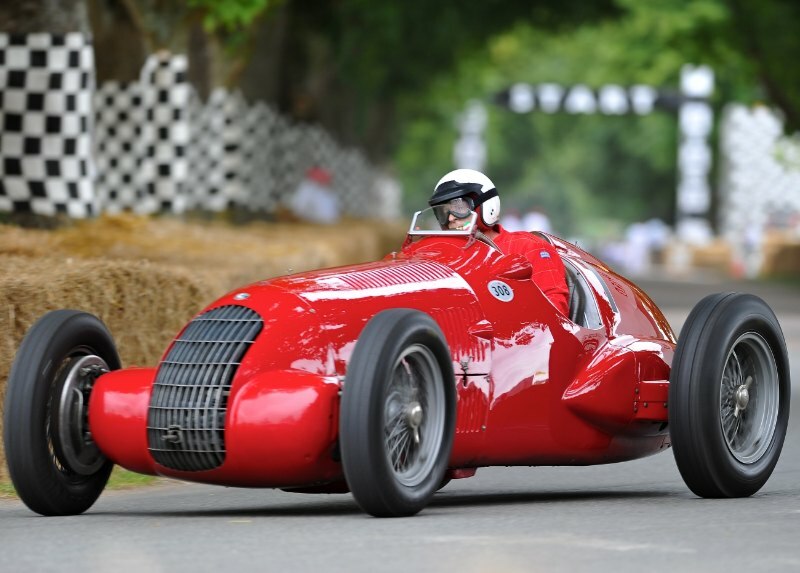 Second would be the Alfa Romeo 308C at Goodwood Festival of Speed, it’s just classic. Third would be 1965 Lotus Elan of Bob Leitzinger during HSR Mitty Speedfest. Darren Pierson really captured what the Leitzinger family does best! The Tyrell 004 is what historic racing is all about, an iconic race car at full chat! Fantastic! I should vote for the Jaegermeister Carrera because I know the owner, but the best shot to me is the 3 Bughattis into the corkscrew. The body English, the cornering set of all three. It’s correography. car . It was very clear and showed the details. Really like the 1971 Tyrell 004! Best photo of the group. Very tuff choice, being Shelby’s Cobras are amoung my favorite race cars of all time and having met Lynn Park several times. But McLarens rank right uo there also, I’m going to give my vote to the photo of the McLaren. Can-Am Thunder lives on!!!!!!! Looking at these amazing shots of vintage racing reminds me that modern day racing may be faster, but nowhere near as interesting. The 1961 Mini is number one for sure! My Vote is for the Yellow Mini!! Just how it should be, Fun, Fast and on 2 wheels! Great action shot with 2 wheels off the ground of Don Racine hard wheeling his 61 Mini. love that shot. #1 for me. I gotta vote for the Mini on two wheels, that’s 9/10ths driving! How to choose from so many great photos. 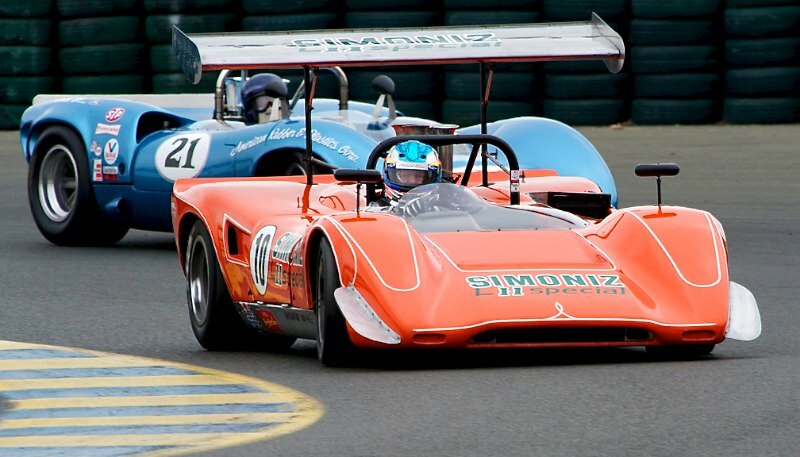 Do you take the thunder of the F5000s or the fire and brimstone of the Porsches at full tilt. Or the beautifully framed Brian Redman Chevron. No, where would I most want to be seated – the Brabham BT24 Martini, all speed, spitting anger, spray and downforce in equilibrium – just magic! Being a Mini Cooper enthusiast, I can’t help but vote for Don Racine in his 1961 classic Mini with the right rear tyre high above the birm. These are all great shots, but that’s my favorite. I love the Lotus Elan: He just looks FAST! Dennis Gray’s photo of the Mini at the Portland Historics race is just superb! Dons yellow mini(#61) on 2 wheels how good can it get? Really like the 2 wheel action of Don Racine’s Mini! Wonderful pics all around, but I’ve got to go with the 2-wheelin’ Mini. Looks like 10.5/10ths driving to me! Don Racine two-wheeling the 61 Mini. And that is how it is done gentlemen. Ten thousand moving parts that work less and less everyday! As of yesterday when we tallied the winner, the Bugatti trio by Dennis Gray had 18 votes, the McLaren M8F by David Ferguson garnered 16 votes and the Tyrrell 004 by Marshall Autry had 15 votes. We had many others in the 7-14 vote range. Thanks to everyone for your comments and votes. It has been fun reading what is important to each person. Congrats to the winner and the two ‘runner-ups’! As mentioned above I agree that it is always nice to know what viewers like/dislike about a specific image! Let’s have a nice (photographic) 2011! Blue Tyrrell! You can feel the intensity of the cornering force! You might want to tally those votes again.. I think your math is pear shaped. Two of my favorite things in a picture: yellow and a Mini. The best action shots are from the Oldtimer Grand Prix- the Porsches coming around that curve. Best portrait of a car is Greg Fisken’s GT40 at Goodwood, with the lights on- tied with that is Lynn Park’s 289 Cobra. Cutest car is the yellow Mini with two wheels in the air. Do they ever have all four on the ground? Austin Mini Cooper! It Rocks, man! Although there are lots of my “if I could only drive…” cars included in the set, I’ve got to go with the Yellow Mini on 2 wheels! I raced H prod in the 1970’s and that picture is a great representation of the thrill of foot to the floor cornering in affordable “everyman” racers. The mini cooper…all the way. “Don Racine two wheels his 1961 Austin Mini Cooper at Portland Historics” I’m partial to the classic Mini. I would like to thank all you subscribers for voting for my images. You all subscribe right? Month after month http://www.sportscardigest.com brings you the best coverage of vintage/historic events. Often the same weekend or latest by the following mid week. You Mini guys keep in touch. I hope to have another image of either Don’s or Dennis’ Mini in the group next year. Last word: Thanks to CSRG, HMSA, Infineon Raceway, Mazda Raceway, Thunderhill Raceway, Portland Raceway, Reno Air Races, and the owners and drivers that brought out these cars. If you see me the track please come up and introduce yourself. To me, the McLaren represents the zenith of auto racing. Pure, unadulterated power, flowing style, and a great collection of drivers. The choice was easy, after following the orange team as a kid. It was complicated by the addition of the Mini, the original tuner car, that opened racing to lots of folks. I prefer the latter, and my vote goes for Dennis Gray’s shot of the Bugatti’s in the Corkscrew at Laguna Seca. Can’t you just feel the cars as they sweep through the turn? If you’ve ever shot racing cars, you’ll also appreciate what a unique opportunity this shot represents. In most races, vintage racing in particular, cars don’t run nose to tail and you have great difficulty shooting cars all together like that. Fantastic job, Dennis, the cars, the track, the turn, the moment, a sensational capture for all of us. And if you like the thunder of the Can Am, David Ferguson’s shot of the McLaren in the late afternoon Autumn sun at Road Atlanta is exceptional. Again, it’s a capture of a unique moment. The chances for such a great car, with great color, against a background of complementary Fall color, in late afternoon light are mighty slim. Great job, David. Makes me rue the fact that most races are run right smack dab in the harsh mid-day sun. I’d like to thank all those folks who like my images enough to comment on them, along with all the other photographers whose work was chosen as well. And a big Thank You to all the racers for bringing these great cars out for us to shoot. Watch these pages in 2011, we’re all planning on having a lot more for next year. That Lotus Elan say it all for me. Part of the impact comes from the colour effects. Some get it just wrong – like the pale e-type Jaguar against an insipid background; a stronger car-colour would have brought the picture to life. The shape of the car matters, so the pre-war racers offer an advantage to the photographer. Another example of a missed opportunity is the Auto-Union at Goodwood, an ordinary shot of an incredibly special machine. My vote goes to the orange Maclaren because there is an amazing tone blend of the car and its racing environment, plus the way the car’s shape has become part of the composition. I don’t like orange Maclarens, but what a picture! There are so many fine pictures it’s hard to choose but for me it has to be the BT 42 at Spa – a wet Spa, a BT42 with how many wheels on the ground – is that why Watson could do no better than 11th at the 1974 Belgium GP? All the shots are incredible. But I love the Bugattis in the Corkscrew at Monterey Motorsport Reunion (photo credit: Dennis Gray). .My choice for best photo is the Tipo 60 Maserati at Monterey by Dennis Gray.It shows off the lines of one of the great car designs,but from the point of view of photography. It’s one of those shots that you wing it .You shoot hoping for the best and once in a while it pays off with a realy good photo. The M8F at Road Atlanta is drop your drawers gorgeous. C’mon, you guys, even if if wasn’t my car, Dennis Gray’s photo of the # 16 Cobra at Sears Pt. is clearly the best . Besides, look under the car and you”ll see another Cobra following.